Norwegian police have booked what's likely to be the country's first drink-driving Segway user - a mere month after a national ban on the devices was lifted. 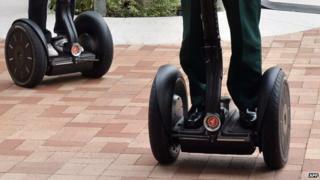 The man was arrested in a smart restaurant area in central Oslo after several witnesses reported him for "strange behaviour" as he struggled to balance on his Segway, the Aftenposten daily reports. Police suspected him of being drunk in charge of a Segway and took him in. They are still awaiting the results of a blood test, but Finn Erik Groenliveien - head of Oslo traffic police - is already concerned Segway users may think rules about drinking and driving don't apply to them. "I really hope we're not risking having lots of drink-drivers on two-wheeled vehicles," Groenliveien says. "These are treated like any other vehicle when it comes to the limit on blood alcohol." Police inspector Jan Guttormsen says it's the first case he's heard of. "I'm not surprised, but disappointed they don't appreciate the danger." Before 1 July "self-balancing vehicles" were banned in Norway because their top speed of 20km/h (12mph) meant they would've been classed as mopeds, and the roads administration didn't think they were safe enough. But the government legalised them anyway, hoping the vehicles will help "revolutionise traffic patterns".